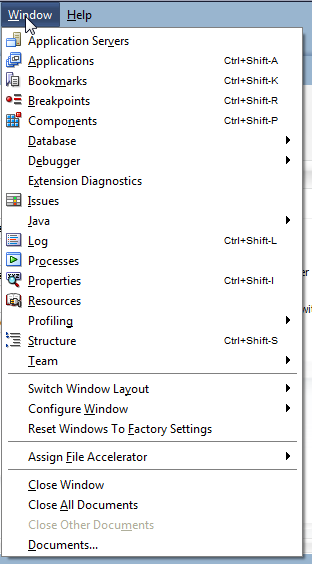 One of the first things I noticed about 12c is the movement of the panes from the view menu to the window menu. I sometimes get a bit too aggressive in closing a lot of the little panes. When I want to get them back later, I just use the View menu (Window menu from now on) to get them back. However, I noticed another really great features in JDeveloper 12c. You can drag your panes outside of your JDeveloper in 12c. This can be helpful if for example you want a small log window showing on your other monitor, but not the whole JDeveloper. Just like you normally move a pane around in JDeveloper, for example I like to have my properties on the bottom instead of on the right side, click the pane and drag the pane out of your JDeveloper window. Besides this, you can also reorder you tabs in JDeveloper by simple drag & drop, just like you're used to in your browser.